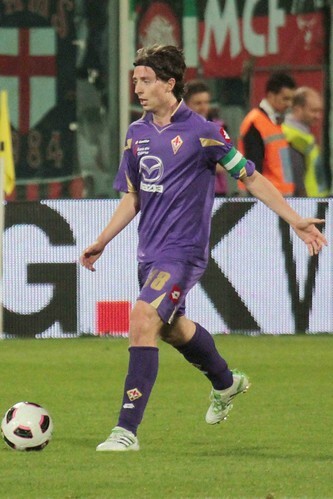 After being given an ultimatum by Fiorentina’s coach, Sinijsa Mihaljovic to immediately make a decision regarding his future at the club, the Viola’s captain, Riccardo Montolivo, finally revealed that he won’t extend his expiring contract with the club. The captain stated that his current deal that will end in 2012 wont be renewed but still the midfielder hasn’t decided whether to leave the Florence based club or not next season. Furthermore, Montolivo also explained that money and also personal ambition was never his reasons in rejecting the contract extension, but it was because there have been a change of atmosphere in the club recently which makes him feels different. However, the player did stated that if he didn’t made any deal with another club in the summer, he would gladly finish off his remaining contract with the Viola for one more season before leaving the club once his deal ends. Although still pledging his loyalty to the club, considering the situation, Fiorentina would probably decide to cash in on their captain this season as keeping him until his contract runs out means that Montolivo will walk out for free. The midfielder statement could even be made as a sign to the Viola in making and immediate decision to chose which offer that would suits them the most as it would be much more profitable for the Florence based side to sell him this season. Rumors stated that the likes of Bayern Munich, Inter Milan and Juventus are very keen on acquiring his service with the German side being the most favorite considering Fiorentina’s refusal in strengthening their local rivals. Moreover, Bayern supposedly have a much more stronger financial status compared to both Inter and Juve, considering the fact that Bundesliga have really turned into a very profitable league recently.